A film industry prop maker, who has spent eight months collecting the celebrity signatures of the cast and crew of the iconic Star Wars films, including Harrison Ford, Daisy Ridley, Adam Driver and John Boyega, is to give it away for charity, with the proceeds going to the national disability charity Sense. 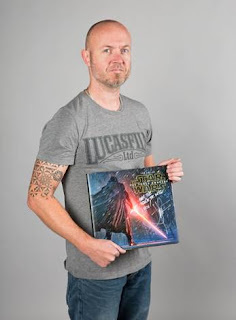 Lifelong Star Wars fan, 43 year-old Neil Ellis, from Elstree, Hertfordshire, landed his dream job when he started work for Lucasfilm as a concept model maker and specialist in the costume FX department. His work on the new films, including last year’s ‘Episode VII’, and this year’s Rogue One, sparked the autograph idea, and he says he quickly decided that he wanted to do it to benefit people with sensory impairments, a specialist area for Sense. The autograph book, which also includes Mark Hamill, Carrie Fisher, Anthony Daniels and Kenny Baker from the original series, and new series’ directors Gareth Edwards and Rian Johnson, is displayed in a spectacular ‘Millennium Falcon themed’ bronze-cast that Neil has designed himself. Rather than auction the book off to the highest bidder, Neil has made the decision that every fan should have an equal chance to win it. The public are being invited to make a minimum donation of £5 to Sense through Neil’s fundraising page, with one lucky donor being selected at random by Neil to win the prize on May the Fourth: Star Wars Day (4 May 2017). Sense Deputy Chief Executive, Richard Kramer, said: We’re incredibly grateful that Neil has chosen to support Sense. Not everyone will be lucky enough to win the prize, but they can be certain that the donations will go towards supporting people who are deafblind, have sensory impairments or complex needs, to enjoy more independent lives.